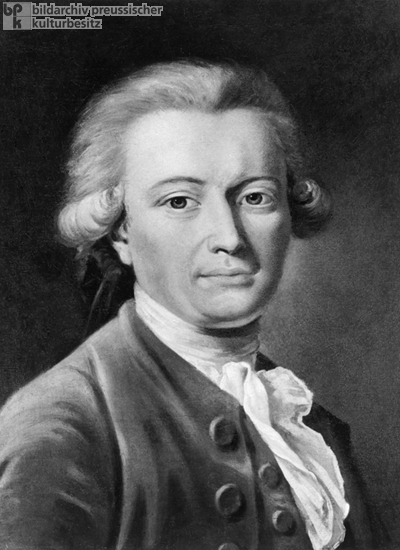 The naturalist, travel writer, and politician Johann Georg Forster (1754-94) was the founder of a new literary genre: the scientific travelogue. From 1772 to 1775, he and his father accompanied Captain James Cook (1728-79) on his circumnavigation of the globe. In 1777, Forster published his account of the epic journey, A Voyage towards the South Pole and Round the World. He taught as a professor of natural history in Kassel and Vilnius until 1788, when he accepted a position as a librarian in Mainz. There, his life took a decidedly political turn. When French revolutionary troops occupied the city in 1792, Forster joined the local Jacobin club and went on to play a prominent role in the short-lived “Mainz Republic” of 1793, the first emulation of the French Revolution on German soil. Painting by Johann Heinrich Wilhelm Tischbein (1751-1829), undated.